The Beatles Through The Years: Paul McCartney To Perform at the VE Day Celebrations In London. Paul McCartney To Perform at the VE Day Celebrations In London. 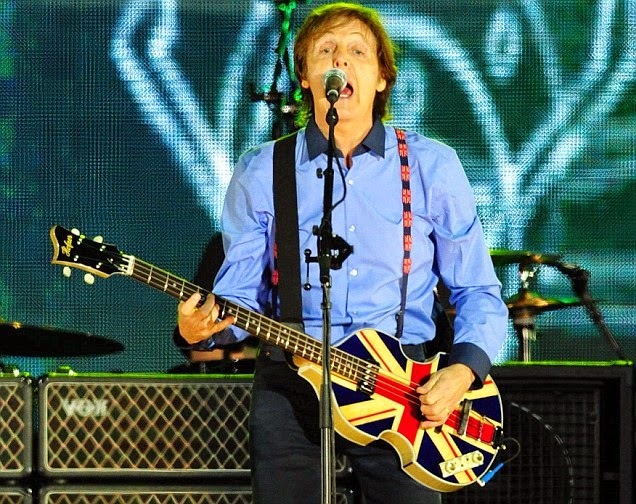 A Victory To Remember: Macca to rock the 70th Anniversary of VE Day in London. There are reports that a concert commemorating the 70th Anniversary of the Allied Victory over the Nazi's in Europe in 1945 is to be headlined by Rod Stewart, Elton John and Paul McCartney in May. The concert is reportedly going to be held in London at Horse Guards Parade, which is the venue for the annual 'Trooping The Colour' celebration for the Monarch's Official Birthday. The concert will be live broadcast in the UK and apart from Macca, Elton and Rod will feature a number of other artists who have yet to be confirmed. It is also reported that Dame Vera Lynn will make an appearance. Lynn, who has recently marked her 98th birthday, is best known for her hits during the Second World War that include "(There'll Be Bluebirds Over) The White Cliffs of Dover" and the song that made her the British Forces' Sweetheart, "We'll Meet Again". We can't wait to see Paul play this and if the reports are true, which I'm sure they are, it's going to be quite a night!